Disasters and Public Health: Planning and Response, Second Edition, examines the critical intersection between emergency management and public health. It provides a succinct overview of the actions that may be taken before, during, and after a major public health emergency or disaster to reduce morbidity and mortality. Five all-new chapters at the beginning of the book describe how policy and law drive program structures and strategies leading to the establishment and maintenance of preparedness capabilities. New topics covered in this edition include disaster behavioral health, which is often the most expensive and longest-term recovery challenge in a public health emergency, and community resilience, a valuable resource upon which most emergency programs and responses depend. The balance of the book provides an in-depth review of preparedness, response, and recovery challenges for 15 public health threats. 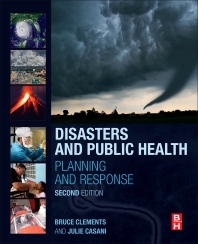 These chapters also provide lessons learned from responses to each threat, giving users a well-rounded introduction to public health preparedness and response that is rooted in experience and practice. Bruce Clements serves as the Preparedness Director at the Texas Department of State Health Services (DSHS). He previously held the equivalent position for the State of Missouri. In this capacity, he provides leadership and oversight for public health preparedness programs and related legislative initiatives in Texas. These efforts combine the disciplines of public health, clinical medicine, emergency management, and public administration to build a state wide public health and medical emergency response infrastructure. In addition, he manages federal public health and healthcare system preparedness grants and provides direction for state wide preparedness activities including preparedness planning, training, and exercises. He also serves as a Commissioner for the Texas Commission on State Emergency Communications representing the Department of State Health Services and providing oversight of the state wide 9-1-1 Call Centers and Poison Control Programs. He has current Adjunct Instructor appointments at the Texas A&M Health Sciences Center, College of Medicine (Round Rock, TX); Texas A&M Health Sciences Center, School of Rural Public Health, Department of Health Policy & Management; and the University of North Texas Health Science Center, School of Public Health, Department of Environmental and Occupational Health. He has published a variety of articles on preparedness and has contributed book chapters. He has also lectured extensively on preparedness topics for over 20 years. Dr. Julie Casani is the Director of Public Health Preparedness and Response in the North Carolina Division of Public Health. This branch coordinates the preparedness system for 85 local health departments and 4 regional offices. In addition to planning activities at the local, regional and state level, this branch is responsible for providing Public Health coordination, subject expertise and support to local health departments. From 1999-2006, she was the Preparedness Director at the Maryland Department of Health and Mental Hygiene. Her office was lead on the anthrax events of 2001, implemented a number of enhanced health surveillance systems for bioterrorism including BioWatch and the National Capitol Region Syndromic Surveillance Project, and developed and implemented the Smallpox Preparedness and Response Program. She is Adjunct Associate Professor at NC State University where she instructs in Global Public Health, Agriculture Security and One Health. She has been a policy and health practice consultant to several national workshops and committees on Weapons of Mass Destruction for federal and state agencies, serving on 3 Defense Science Boards. Currently, she is a member of the Homeland Security Science and Technology Advisory Committee for DHS. Dr. Casani practiced clinical emergency medicine in the Johns Hopkins system from 1983 until 2001. She has been actively involved in emergency medical services since the 1970s, serving at every level from ambulance provider to an appointed member of the Maryland State EMS Board.